Prior to his infamous involvement in the 1919 Black Sox Scandal, Chick Gandil was one of the most highly regarded first basemen in the American League, both for his play on the field and his solid work ethic. In 1916 a Cleveland newspaper described Gandil as “a most likeable player, and one of excellent habits.”1 From 1912 to 1915 the right-handed Gandil starred for the Washington Senators, leading the club in runs batted in three times and batting .293. In the field Gandil paced American League first sackers in fielding percentage four times and in assists three times. He continued his strong work with the Chicago White Sox from 1917 to 1919, helping the club to two American League pennants before forever tarnishing his legacy by helping to fix the 1919 World Series. Yet Gandil may have been the only banished player who gained more than he lost from the fix. After the 1919 World Series, the first baseman retired from major-league baseball, reportedly taking $35,000 in cash with him. Arnold Gandil was born on January 19, 1888, in St. Paul, Minnesota, the only child of Christian and Louise Bechel Gandil. The family relocated to Berkeley, California, where Gandil was raised. As a youngster he loved baseball, splitting his time between pitcher, catcher, and the outfield. By all accounts he was a problem child, and after two years at Oakland High School2 (where he also played quarterback on the football team), Gandil left home to make it on his own. Gandil spent the 1908 season with Shreveport (Louisiana) in the Texas League, batting a solid .269. Off the field, he wed Laurel Kelly, a 17-year-old Mississippi native who went by Faye.7 They had one daughter, Idella, and were married for 62 years. After the season Chick was drafted by the St. Louis Browns, but failed to make the club the following year. The Browns ordered him back to Shreveport, but Gandil refused to report, instead joining the Fresno team in the outlaw California State League. Faced with being blacklisted by Organized Baseball, Gandil joined Sacramento of the Pacific Coast League for the 1909 season. He was soon arrested for absconding with $225 from the Fresno team coffers,8 but had good success in Sacramento, batting .282. Late in the year he was sold to the Chicago White Sox, but wasn’t required to report until the following season. Gandil spent the offseason back in Shreveport as a policeman11 and then reported to Montreal in the spring. He responded with a solid season, batting .304. In December 1911 Chicago Cubs owner Charles Murphy worked out a deal to acquire Gandil for $5,000 and two players, but two other National League teams blocked the transaction.12 So Gandil returned to Montreal. Gandil got off to a solid start in 1912, batting .309 in 29 games, after which he was traded to the Washington Senators. This time, the big first sacker was ready for the major leagues, and in 117 games with Washington he hit .305 and led American League first basemen in fielding percentage. Gandil continued to perform well with Washington both at bat and in the field. In 1913 he hit for a career-high average of .318. He was also tough and durable, averaging 143 games during his three full seasons with Washington, despite knee problems that haunted him throughout his career. When asked by a reporter after the 1912 season what his greatest asset was, he replied “plenty of grit.”14 He reportedly used the heaviest lumber in the American League, as his bats weighed between 53 and 56 ounces. Gandil was sold to Cleveland before the 1916 season for a reported price of $7,500. One of the main reasons for the sale was supposedly the fact that Gandil was a chain smoker, occasionally lighting up between innings, which annoyed Griffith.15 In any event, the Indians also picked up Tris Speaker for that season, and things were looking bright in Cleveland. Although the Indians only climbed from seventh place to sixth, the team won 20 more games than the previous season, reaching the .500 mark. Gandil was unspectacular, batting only .259. Gandil appeared in 149 games for the 1917 world champion White Sox, batting .273 with little power. He then hit .261 in the World Series win over the New York Giants, leading the team with five RBIs. 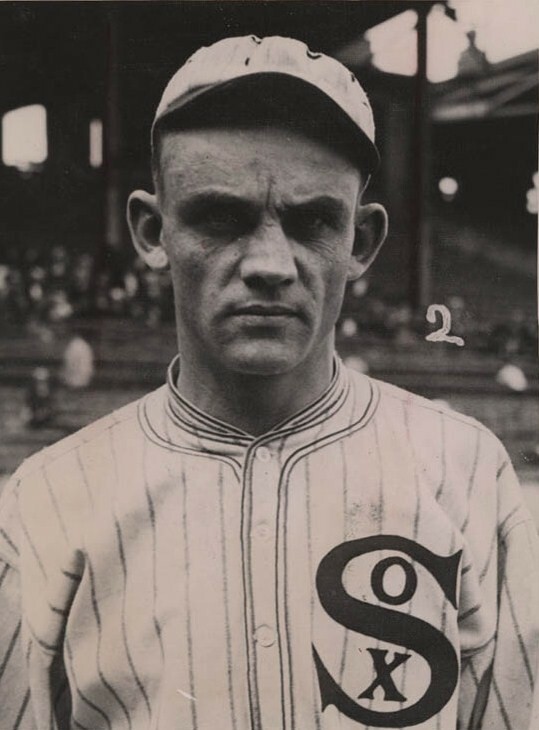 Exempt from the draft because he had a wife and daughter, Gandil had a similar year in the war-shortened 1918 season, batting .271 in 114 games, as the White Sox slumped to sixth place. No one knows the full story of the Black Sox scandal – few of the participants were willing to talk, and the whole plot was confused and poorly managed. But by all accounts Gandil, furious with Comiskey’s miserly ways, was one of the ringleaders. Most accounts agree that it was Gandil who approached gambler Sport Sullivan with the idea of fixing the Series, and that he also served as the players’ liaison with a second gambling syndicate that included Bill Burns (a former teammate of Gandil’s) and Abe Attell.18 Chick was also the go-between for all payments, and reportedly kept the lion’s share of the money. Though none of the other fixers took home more than $10,000 from the gamblers, Gandil reportedly pocketed $35,000 in payoffs. It’s interesting to note that Gandil had a reasonably good Series. Although he hit only .233, that was the fourth best average among White Sox regulars. He was second on the team with five RBIs, and he had one game-winning hit. However, he made several suspicious plays in the field, and all but one of his seven hits came in games the fixers were trying to win, or in which they were already losing comfortably. Rumors of a Series fix began to circulate, with Gandil’s name prominently mentioned. The next spring Gandil demanded a raise to $10,000 per year. When Comiskey balked, Gandil and his wife decided to remain in California. Flush with his financial windfall from the Series, Gandil announced his retirement from the majors, instead spending the season with outlaw teams in St. Anthony, Idaho, and Bakersfield, California.19 Thus Gandil was far away from the scene as investigations into the 1919 World Series began during the fall of 1920. After the players’ acquittal on conspiracy charges in August 1921, Gandil said, “I guess that’ll learn Ban Johnson he can’t frame an honest bunch of ball players.”20 However, the players’ joy was short-lived, as Commissioner Kenesaw Mountain Landis announced that the eight Black Sox were permanently expelled from baseball. By the early 1930s Gandil and his wife had settled in Berkeley, California, where he worked mostly as a plumber.22 Around 1956, Gandil and his wife moved to Calistoga, in the Napa Valley. He had carbuncles, and the town’s mud baths and mineral springs aided his health. Chick Gandil died at the age of 82 in Calistoga on December 13, 1970, and was buried in St. Helena Cemetery in the nearby town of the same name. The cause of death was listed as cardiac failure. People in town had no idea of his fame, and his death reached the sports wires only due to the efforts of SABR founding member Tom Hufford. Cleveland Plain Dealer, June 1, 1919. Ginsburg, Daniel, The Fix Is In (Jefferson, North Carolina: McFarland & Co., 1995). The files of Tom Shea. Letter to Joe Gedeon dated September 15, 1921. Saturday Evening Post, April 30, 1938. Arizona Daily Star (Tucson), December 16, 1990. 1 Cleveland Press, March 17, 1916. 2 “‘Chic’ Gandil, the Man Who Started the Famous ‘Seventeen Straight,’” Baseball Magazine, August 1914, accessed online at LA84.org. In 1940 Gandil reported that he had completed four years of high school to US Census takers. Regardless of whether he completed two or four years, it’s clear that Gandil, like his future White Sox teammate Swede Risberg, had more formal education than is commonly believed. 3 Los Angeles Herald, June 20, 1904; Bisbee Daily Review, June 27, 1909; Amarillo Daily News, January 7, 1913. 5 Chick Gandil as told to Melvin Durslag, “This Is My Story of the Black Sox Series,” Sports Illustrated, September 17, 1956. 6 New York Times, June 3, 1906; John Mason Hart, Revolutionary Mexico: The Coming and Process of the Mexican Revolution (Berkeley, California: University of California Press, 1997). 7 Ancestry.com, US Censuses 1920-40; Santa Rosa Press Democrat, December 14, 1970. 8 San Francisco Call, March 25, 1909. 9 Chicago Tribune, December 19, 1920. 10 New York Times, April 22, 1911. 11 Chicago Tribune, September 20, 1910; December 24, 1910. 12 Chicago Tribune, December 16, 1911. 14 Chick Gandil player file, National Baseball Hall of Fame Library, Cooperstown, New York. 15 Cleveland Press, March 17, 1916. 16 Chicago Tribune, March 2, 1917. 17 Bob Hoie, “1919 Baseball Salaries and the Mythically Underpaid Chicago White Sox,” Base Ball: A Journal of the Early Game, Spring 2012, Volume 6, Number 1 (Jefferson, North Carolina: McFarland & Co.). 18 Bill Lamb, Black Sox in the Courtroom: The Grand Jury, Criminal Trial, and Civil Litigation. (Jefferson, North Carolina: McFarland & Co., 2013). 19 Idaho Statesman, February 23, 1920, and June 11, 1920; The Oregonian (Portland), September 29, 1920. 20 Chicago Tribune, August 3, 1921. 21 Lynn Bevill, “Outlaw Baseball Players in the Copper League: 1925-27” (master’s thesis, Western New Mexico University, 1988), accessed online at BevillsAdvocate.org. 22 United States Censuses, 1930-40, accessed online at Ancestry.com.